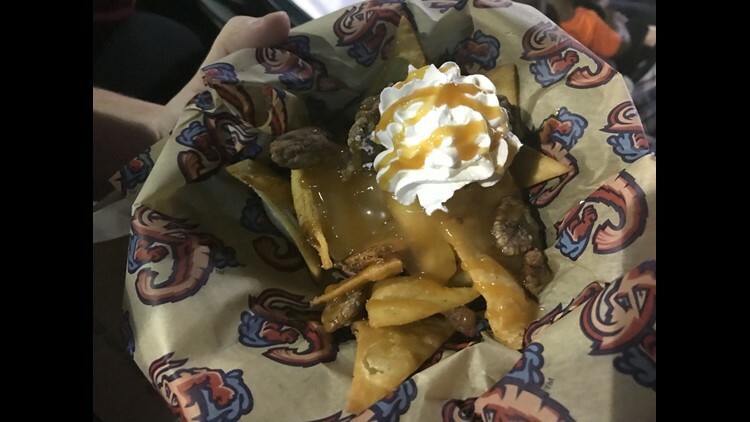 In this week's Back to the Minors blog, the Jacksonville Jumbo Shrimp have a new fun dessert option, Apple Pie Nachos, while the Armada are celebrating their first ever playoff appearance. In the past week and a half, I have been to two minor league sporting events in Jacksonville, each very memorable for different reasons. 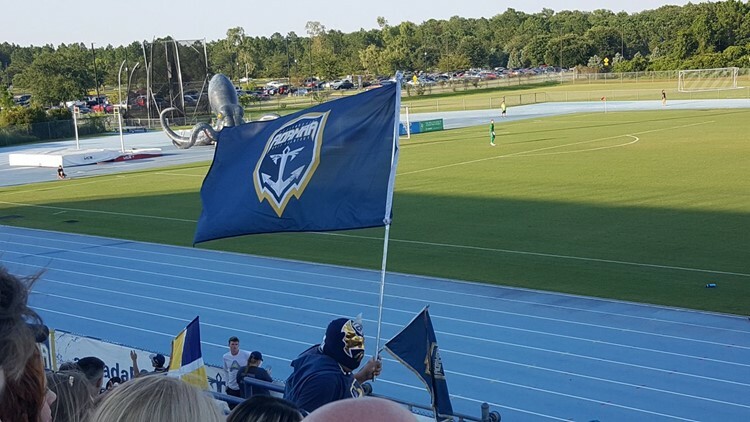 Wednesday night, history was made as the Jacksonville Armada soccer team played its first-ever playoff game at Hodges Stadium. Back on July 3, the Jumbo Shrimp made ballpark dessert history by presenting "Apple Pie Nachos" as a dessert option at the All American JAX concession stand. Let's start with the action on the pitch. The Armada hosted Miami United FC in the semi-finals for the National Premiere Soccer League Sunshine Conference, a group of Florida-based teams. This same Miami United FC Squad (not to be confused with Miami FC, who I will get to in a minute), knocked the Armada out of the U.S. Open Cup tournament and prevented them from having a match against Major League Soccer's Orlando City. A quick goal put the Boys in Blue (Jacksonville) up 1-0 about five minutes into the match. Miami United FC tied it up 1-1 just before halftime. Armada head coach Mark Lowry's halftime speech must have been a good one because the Armada came out firing, scoring two quick goals in the first few minutes of the second half and they added yet another with about 12 minutes left, all of which thrilled a season-high crowd of over 2,000 at Hodges Stadium. The Armada came home with a 4-1 victory. So the Armada beat Miami, and they now play, Miami, (FC that is), their former NASL rival. That match is this Saturday in South Florida and it's for the Sunshine Conference title. A win there would put the Armada into a regional playoff with the potential to make a national one. Personally, I love soccer and I'm thrilled for the Armada, especially club president Nathan Walter and head coach Mark Lowry. This club has been through some tough times, almost going out of business, league ownership, and the NASL season cancellation. The future is very up in the air for the team, who according to the Florida Times-Union wants to move their home games next year to Patton Park. But it is very nice to see the team being successful "on the pitch" this year. Now, on to that AMAZING dessert. My wife and I attended the Jumbo Shrimp's annual July 3rd fireworks spectacular (the fireworks show was incredible, the game, not so much as the Shrimp lost 3-1). I had been seeing social media throughout the day about the Shrimp's new (and temporary) dessert option, the previously mentioned "Apple Pie Nachos". After the 7th inning stretch, I made my way over to the concession stand and after some confusion as to whether they had run out, I shelled out the $8.00 for the dessert. Let me tell you something ... it was messy but DELICIOUS. The "chips" were sweetened crisps with a hint of cinnamon, there were HUGE chunks of apple, all with a caramel drizzle and whipped cream. It was a perfect amount for two to share, just make sure you grab extra napkins. We are told the "Apple Pie Nachos" will be around for a limited time, but we were given no specific answers as to how "limited" that would be. So if you happen to catch a game soon, and Apple Pie Nachos are still there (At the All American JAX stand), I'd say go for it. The Jumbo Shrimp are at home through Sunday, July 16, with a series against Biloxi. Sunday's game is "Words with Fans" night, where the Shrimp will be sporting "Scrabble-themed" uniforms and the world champion of Scrabble will attempt to set a record for a number of simultaneous games being played at once. Indoors and across A. Phillip Randolph Boulevard, the Jacksonville Sharks will host "Star Wars Night" on July 21 as the arena football team takes on Columbus (GA). The first 1,000 kids get free lightsabers. Get your best Han Solo, Princess Leia, or Jar Jar Binks (eek) costumes ready and head out to the arena. Tickets start at $11 and are available here. Back to the Minors author Neal Bennett is the former Digital Director at First Coast News. He now works for the station's parent company, TEGNA Media, and is a huge fan of all of Jacksonville's minor league teams. Follow Neal on Twitter @Nbace.